I live at the intersection of Prince St and Lafayette AVENUE in the North End. My wife and I joke about it all the time, because it's basically an alley. I have to imagine neither the name nor the designation is original. There is also an "Avenue De Lafayette" off of Washington St in Downtown Crossing, which at one point in the 90s got a horrible street sign that said "De Lafayette Ave" (now fixed). Seems strange that there are two streets with nearly the same name so close together. Must be an interesting story there. Avenue de Lafayette was named after Lafayette Place, as the main entrance to the mall complex was on that road. Anyone have an answer to my question on Mass Ave @ 20, above? You sure it wasn't maybe the other way around? Needless to say, Lafayette's fame and importance to Boston and the United States predates any mall. Avenue de Lafayette didn't exist before the mall. 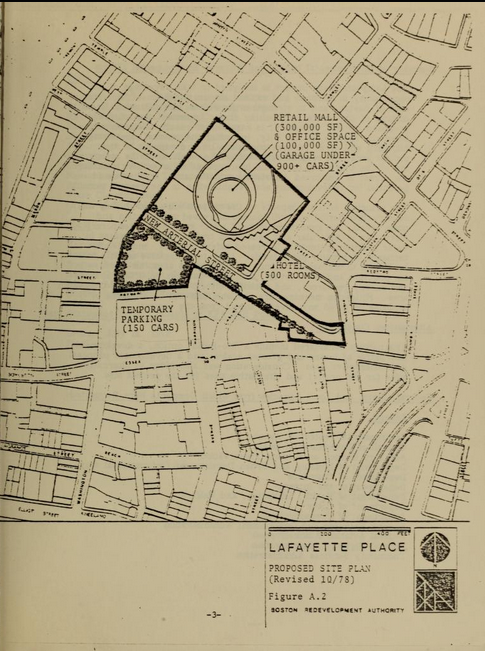 Lafayette Place was developed by a Canadian developer and hence got a very French name. 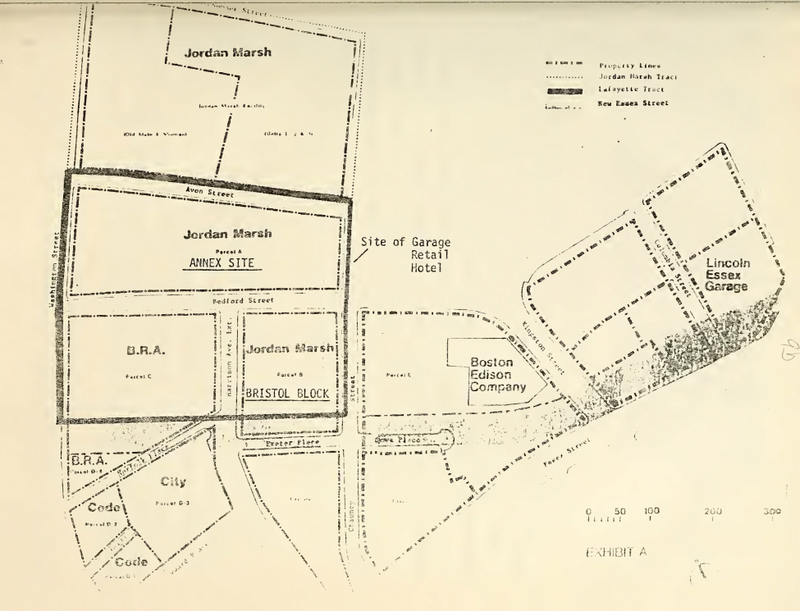 "Exeter Place" and "Norfolk Place" were the cross streets at the edge of the property at the time. The straight Ave de Lafayette was carved by the mall. Last edited by datadyne007; 07-15-2015 at 12:34 PM. Back Bay cross streets are an alphabetical set of posh-sounding Anglo names. Why this particular set? . Earls? Houses of Earls? Names associated with Devon(shire)? Mansion names from London? That they seem to have been chosen for (1) Alphabetization (2) General Hoity Toity airs and (3) alternating between 2 and 3 syllables suggests that they were "purely fanciful" (then again, I think you'd get some disagreement on how many syllables are in "Berkeley" and "Gloucester" depending on whom you asked at UK/US places and eras. Also were Ipswich, Jersey, and Kilmarnock really part of the original set or were they a later "me too" attempt? Arlington (along the western edge of the Public Garden), Berkeley, Clarendon, Dartmouth, Exeter, Fairfield, Gloucester, and Hereford. 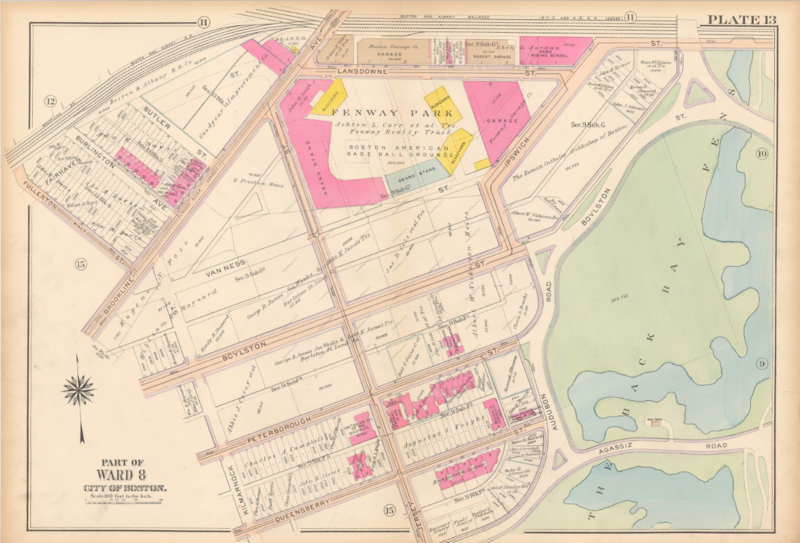 A 1874 guidebook noted the trisyllabic-disyllabic alternation attending aforesaid alphabetic appellations, and the series continues in the adjacent Fenway neighborhood with Ipswich, Jersey, and Kilmarnock Streets. West of Hereford are Massachusetts Avenue (a regional thoroughfare crossing the Harvard Bridge to Cambridge and far beyond) and Charlesgate, which forms the Back Bay's western boundary. I've heard BArkley, but do people say Berk-e-ley (or Glaw-chest-er)? I took a History of Boston type course at BU once that was taught by Mayor White's son. He claimed that the streets of the Back Bay were deliberately given very English names as some not-so-subtle "Irish Keep Out" signage. I doubt there is any documentation backing up that assertion so take it as you may. First, if that's the vibe the Irish got, you can hardly blame them for concluding that it was what we'd now call a "microagression"
Second, the time and vibe (profoundly "English") are right for the kind of business that anyone able to participate in vast townhome building would have thought completely natural. My impression is that they were named for English nobility, particularly earls or dukes. A quick internet search brings up contemporary or otherwise recent earlships for every street name except Fairfield and Ipswich. He also got to the World Series a number of times before the team lost. If one of those runs won once, then the argument all of a sudden becomes moot? I am not personally that interested in honoring him, but I'm not one who want everyone who don't meet to the values we have now have to feel embarrassed. BTW, I'm not white if you're thinking of that. Boston Red Sox owner John Henry has wanted the city to change the name of Yawkey Way for a while, and the current political climate might provide the right timing. Henry told the Boston Herald that he is "haunted" by the racist legacy of previous owner Tom Yawkey, who led the team from 1933 to 1976. Although Yawkey is in the Baseball Hall of Fame, he also owned the last team in Major League Baseball to integrate -- 12 years after Jackie Robinson broke the color barrier. Even after integrating, Boston was known as an uncomfortable place for players of color to play. But certainly not in this thread. Mods? MOD NOTE: This is a thread about Boston street names. Any posts that wander from that topic will be moved to an appropriate (and possibly locked) thread. Sort of a win/win for him I would say. Agreed. There's Yawkey stuff all over the city from the benign (IMO) like street names to the good (IMO) like cancer centers. They obviously gave a truckload of money to altruistic endeavors and now we have to associate those with negative aspects of the donors? They did a good thing let's leave it at that. I think there's a line and Henry is crossing it. I think he's just being opportunistic here. If the voice was someone else perhaps, ie the mayor or someone of that ilk I would probably be on board. Henry, not so much. Oh, don't get me wrong, I think it should be changed, and I think Henry legitimately does as well, I just think he knows he getting good PR out this too. So win/win. The question is, what should it be changed to? I would be fine with that, but I'm guessing Henry will be pushing for something a little 'on-brand' or at least brandable.